Was Kraang Prime actually the 2012 version of the 2003 Shredder? I have just been watching the 2003 series and Shredder/Ch'rell's plans to enslave the Utrom race sounded rather familiar. Because in the 2012 series we find out that Kraang Prime is a corrupt Utrom who used his impressive psychic powers to enslave a large number of Utrom, transforming them into The Kraang. So given the fact that Ch'Rell was out to do something similar, we can assume that Kraang Prime is the version of Ch'Rell who actually accomplished just that. Last edited by The Great Saiyaman; 10-02-2018 at 09:27 AM. Not sure? To be honest, it was kind of up in the air what Ch'rell actually wanted outside of being a warlord. As far as I could tell, the only reason he targeted his homeworld was because they branded him a war criminal. I can't recall Chrell trying to enslave any other Utroms by doing mind tricks. When talking about enslaving other Utroms, I take it for granted he meant something traditional, like kidnapping them in spacecraft and forcing them to work and threten to kill those who tried to run away. 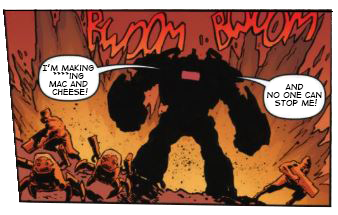 The genocides Chrell carried out, however, made me think of Archie Krang. Last edited by Original TMNT Cartoon Fan; 10-09-2018 at 11:45 AM. 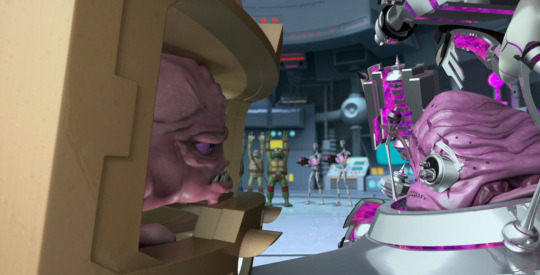 Queen (or Rook, I can't remember this point) describes the original "Kraang" as having been a scientist who wanted more power, and we were even shown what he looked like before he got all...bloated. I've also seen a theory that Ch'rell lacked the mental abilities that other Utroms had - which is why he's never used a levitator pad and why Karai had to carry him on one at some point. So it would be unlikely that he was able to amplify his mind to other Utroms in such a large capacity. There's also the factor that Ch'rell was never a scientist and never directly worked with the scientists he employed. Plus there's the fact that these two versions of Utroms have very, very different designs and somewhat different behaviors. SubPrime/Knight is probably closer to a Ch'rell-type than Kraang Prime. Not just from the "how the fvck did that happen???" scar, to the betrayal of their people being more impactful to the Utroms around him, to their hatred of one Utrom in particular (Mortu, Bishop) that I theorize they had once had a close relationship with, to their disgust with 87 Krang ( ). From what SubPrime said, he and 87 Krang are cousins. Which means that Krang had been another Corrupt Utrom who took on the "Kraang" mantle with Kraang Prime apparently paving the way for them. God, I love that episode. I'm going to get my DVD boxset out and watch it. If that's the case, I think it's a shame we didn't get a background episode which shows exactly how Krang fell out of favor with Prime and SubPrime, we all know that Krang is incompetent but we never found out in what way. But aside from all of that, having Gilbert Gottfried voice Kraang SubPrime, was a (Sub)Prime example of perfect casting, that grating, nasal voice worked so well with SubPrime.